Creatine is a substance which is naturally created by the human body in the liver, kidneys, and pancreas. Creatine can even be acquired directly from food as well as from supplements. Creatine is essential for the synthesis of Creatine-Phosphate (CR-P), an important compound for the production of ATP, which serves as a source of energy for activities involving high-intensity muscle contraction. This offers energy rapidly when carrying out high-intensity activities such as sprinting. Creatine Monohydrate, a popular form of creatine, is considered as one of the most well-known supplements utilized by individuals seeking to create lean muscle mass, increase performance and boost strength. 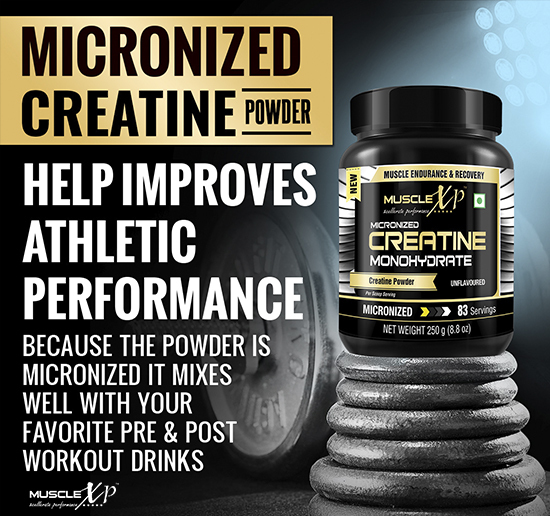 As indicated by the name, Micronized Creatine Monohydrate is essentially a powdered variety of creatine monohydrate that was micronized 20 times. The outcome is a powdery variety of creatine. This variety is more soluble in water, even though it possesses all the other qualities of creatine monohydrate . WHAT ARE THE BENEFITS OF MUSCLEXP MICRONIZED CREATINE MONOHYDRATE POWDER UNFLAVORED? MuscleXP Micronized Creatine concentrate is made up of clinically analyzed and tested creatine monohydrate powder which helps to boost muscle strength as well as power for enhanced performance. It is known to enhance muscle strength when used by older adults who partake in resistance training. Certain people suffer from a disorder that slows down the body’s production of creatine. This can give rise to reduced levels of creatine in vital areas such as the brain. Reduced amounts of creatine in the brain can cause lowered mental function and convulsions. It has regularly been utilized by athletes for a long period of time to boost the recovery of muscles from workouts or exhausting physical activity. This product is able to function fast as it supplies vital nutrients as well as protein to the muscles. This minimizes recovery time and enhances strength, power, as well as lean body mass. The researchers at MuscleXP are extremely particular about the products that the consumers put into their body. This is why they go the extra mile to ensure that every item is wholly safe to utilize. Recently added this creatine powder to my bodybuilding diet. It is affordable. The unflavored powder can be easily added to protein shakes. It dissolves easily. An important amino acid supplement for muscle growth. This creatine powder mixes easily with post workout shakes. Can be easily combined with other unflavored and flavored protein powders. Creatine powder is known to boost endurance and muscle mass. This particular product is easy to take with post workout foods. It blends easily with shakes. After taking creatine powder I do feel a little more energetic during exercises. The powder dissolves easily in water. Creatine is considered an important supplement for people trying to build muscles. I’m working on increasing muscle mass for a few months and recently started taking this supplement. It is good for keeping my energetic. It mixes easily with shakes. This creatine supplement is helping in increasing muscle strength. I am practicing strength training exercise for increasing muscle mass. This is a useful product. 1 level scoop (approx. 3g) is to be blended with 300ml of water or a non-acidic beverage of your preference in order to obtain a powerful drink.